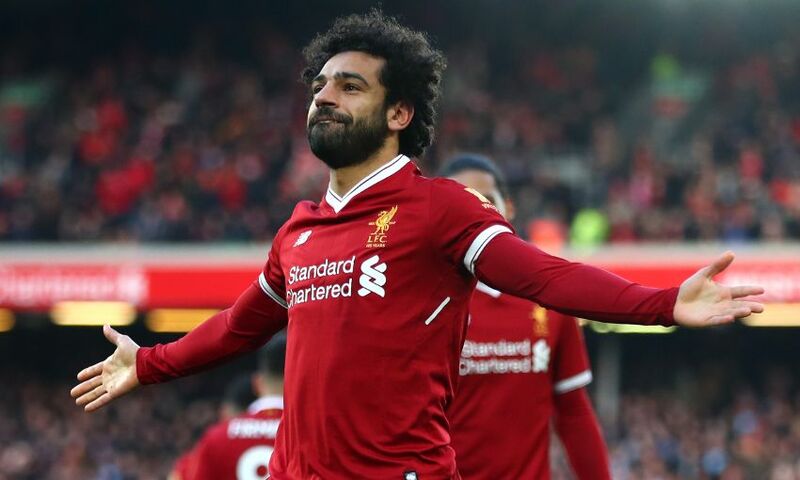 Mohamed Salah's four-goal haul in Liverpool's emphatic 5-0 win over Watford has moved the Egyptian forward into pole position in the race for the European Golden Shoe. The No.11, who also set up Roberto Firmino for the Reds' third strike against the Hornets on Saturday, took his Premier League goal tally this season to 28 to go clear of Barcelona's Lionel Messi and the chasing pack. The Golden Shoe is awarded every season to the most prolific goalscorer across all the top divisions in Europe, with Messi the current holder. Barca's Argentina star notched his 25th strike of the season on Sunday - scoring the second goal in a 2-0 home win over Athletic Bilbao - but couldn't keep pace with Salah's sensational quadruple. The Liverpool forward is now six points clear at the top of the standings, with Messi on 50 points in second. Paris Saint-Germain's Edinson Cavani, Lazio's Ciro Immobile and Tottenham Hotspur's Harry Kane are locked together in third on 48 points. 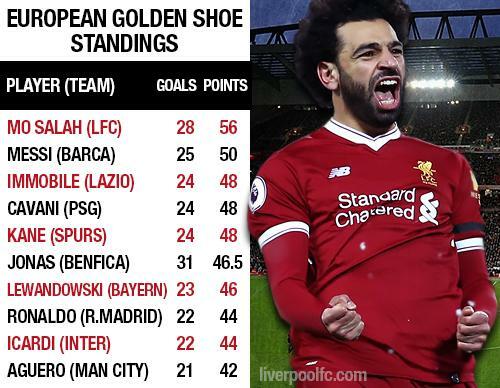 The Golden Shoe is awarded on a point-based system, with goals scored in Europe's top five leagues - England, Spain, Italy, France and Germany - multiplied by a factor of two and the next tier of leagues by a factor of 1.5. The last Premier League player to win the European Golden Shoe was Liverpool's Luis Suarez in 2013-14, when the Uruguayan striker scored 31 Premier League goals for Brendan Rodgers' Reds. The only other LFC player to scoop the award is Ian Rush, who scored 32 goals in the English top flight during the 1983-84 title-winning season.